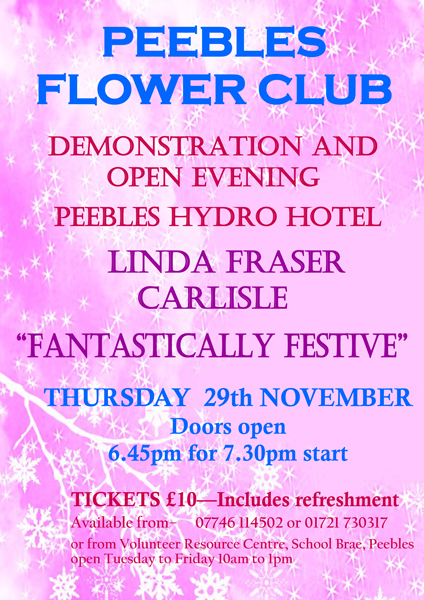 In the beginning….Peebles Floral Art Club - inaugurated in November 1954 – joined forces with Border, Edinburgh, Hawick, and Glasgow – in 1956 – to form SAFAS – the third Area of NAFAS. At our monthly meetings we try to bring you the very best talents and latest styles in floral art from National and Area demonstrators. There are also a few practical evenings for absolute beginners and enthusiasts alike. We have members’ workshops and practical evenings for all levels, from absolute beginners to enthusiasts. Our Sales Table can provide basic supplies, plus some specialist materials needed on practical evenings. Visitors and new members very welcome.